The Kiss Coffeehouse in Myrtle Beach, South Carolina will be selling the KISS Hotter Than Hell ketchup (see photo below) at the Kiss Coffeehouse's second-anniversary party, which will be held on Saturday, September 6. Bottles of KISS ketchup will be on sale for $7.95. As previously reported, KISS guitarist Tommy Thayer will make a special guest appearance at the party. This will be an all-day-and-night rock and roll gathering, with contests and live music. All events will be free of charge. 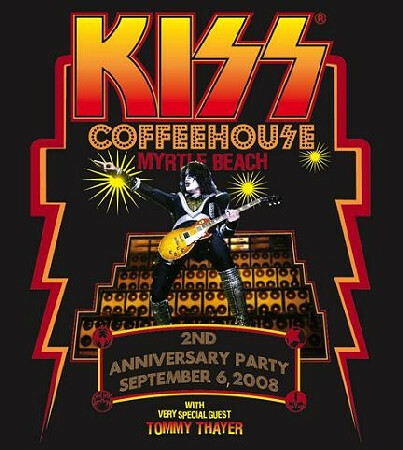 The Kiss Coffeehouse opened to huge crowds in the summer of 2006 and features signature KISS coffees, including Kiss Army Blend and French Kiss Vanilla, the Kiss Frozen Rockuccino, cookies, brownies and other sinful sweets.